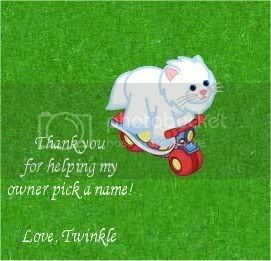 I have my Persian Cat (female) ready here to adopt. But what should I name her... Twinkle, or Blossom? Re: Please help me choose! Of the two, I like Twinkle best. Congrats on the new pet! Choose Twinkle! I think it sounds cute and Blossom sounds kind of colorful like a Sherbert Bunny! I like Twinkle for a persian! That sounds so cute!!! Thanks everyone, Twinkle it is! I just adopted her! Thanks everyone, Twinkle it is! I just adopted her! You are so very welcome! I like Blossom! It sounds so sweet . . . I like Twinkle! It's so cute! I named Mine Serenity.